Vietnamese Banh Khoai Hue is an imperial dish that uses lavish ingredients like egg, liver, prawns and pork belly. Sounds like a crazy combination, but balances out with dramatic effect. Not to be confused with “Banh”, which are small rice pancakes covered in dried prawns and a sweet dipping sauce. This truly local dish comes from central Vietnam. 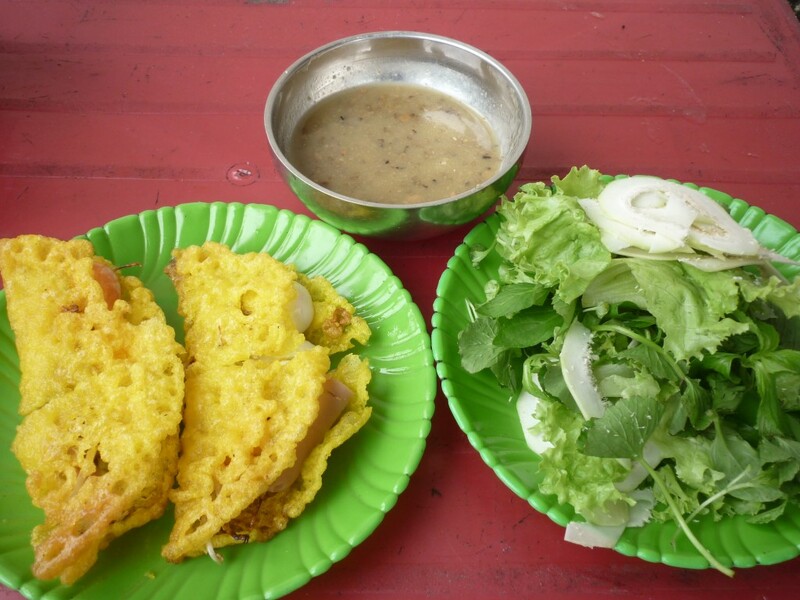 It is a crispy pancake that is eaten with nuoc leo, a rich peanut sauce, which actually also contains a lot of liver and so is truly unique. When this sauce is made it can be frozen and as long as it has been reheated (maximum once) then it can be used in small batches for the next time you eat Banh Khoai and I promise that when you try them once you will want to eat them again! Finely chop the shallot and garlic so they almost make a paste. Roughly crush the peanuts so they are broken into small pieces, some larger than others. In a frying pan add the oil and fry shallots garlic and peanuts on a medium heat. In the meantime finely chop the liver. When the shallots and garlic starts to turn brown add the peanuts, pork stock and water before cooking for 15 minutes for the peanuts to soften. Then add the rest of the ingredients and gently simmer for a further 20 minutes until the liquid reduces by half. Add salt tor MSG at the end and leave to cool. Sieve both flours with the bicarbonate of soda and salt. Separate 3 eggs and add the yolks to the mixture. Whisk in the eggs and then slowly add the water, whisking as vigorously as possible at all times to add as much air to the mixture as possible. Trim off the skin and slice the pork belly 1/2cm thick and In a little oil fry on a low heat until the fat starts to melt. Remove from the pan and into a bowl. Finely chop the spring onions and add to the bowl of pork. Mix well. Whisk together the remaining 3 eggs and leave in a separate bowl. Add a sprinkle of pork and spring onion mix and a small handful of bean sprouts. There should be enough filling so you cannot fully close the pancakes, but not too much so you cannot fold it at all! Drizzle over 2 tblsp whisked egg mixture and cook for 5 minutes before folding the pancake in half in the pan. Leave to rest on kitchen paper to remove excess fat until you have cooked the remaining pancakes. Serve your Vietnamese Banh Khoai with shredded lettuce, chopped mint and coriander Thai basil (if you can get some!) fresh chillies, wedges of lime and the bowl of dipping sauce on the side.